Give someone you love the gift of dance! Our Destiny Dance Studio in Littleton’s dance certificates are a great way to show your love with the gift that gives a lifetime of joy! It is also a unique gift for those in Denver and surrounding areas. Dance certificates are available in any denomination you desire, or you can purchase a certificate with one of our gift packages listed below. Not sure which one to choose? Give us a call and one of our instructors can walk you through the process to find the perfect gift for that perfect friend or relative! Gift Packages: Click on the desired package pricing option below to purchase your unique Denver gift now, you will be asked to register on our site and provide your information as well as the recipient’s information before you purchase. You will then receive an emailed certificate for your convenience! Package 1: This dance certificate includes 6 group dance classes and two Saturday Night Dance Parties. The recipient can choose from one of our 8 weekly group class series and attend all 6 sessions. The recipient will also be able to practice their new moves and make some new friends during a Saturday Night Dance party of their choice! $395 for up to two people. Package 3: This gift package has a little bit of everything! This package includes 2 private dance lessons, 4 group classes, and 1 Saturday Night Dance party. 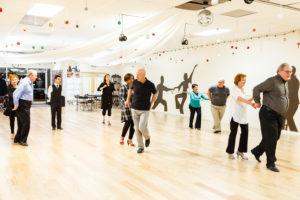 The recipient can enjoy two one on one sessions to focus on the dances of their choice, 4 group class sessions to reinforce what they’re learning OR try a new dance, and 1 Saturday Night Dance party to pull it all together and have a fabulous night! All packages and dance certificate sales from our Littleton studio are final but can be transferred. The recipient has 12 months to use the certificate from the purchase date, no extensions.